Buckle up, this one is pretty long. I finished this book a few days ago and the impression it made on me was so visceral, I had to wait to write about it. When I consider what it takes to be a classic, regardless of the medium, my first thought is timelessness. Will this item stand the test of time and all that entails? I believe that the term classic is bandied about too often and too frivolously. We call anything that we like in that moment a classic and I think that is inaccurate at best. I did not read the Grapes of Wrath in high school or college but I knew its reputation as a classic. I’ve heard it considered a Great American Novel. I’m really only getting to it now because I decided that while I live here in Monterey that I should read Steinbeck’s catalog and after finishing a half dozen of his works last year, I read the novel that represents the pinnacle of his career. The Grapes of Wrath is one of, if not the best, novels I have ever read. It probably supplants Slaughterhouse-5 as my all-time favorite but I want to avoid the recency bias as much as possible so I will hold off on that declaration for now. As usual, I’m not going to summarize the book. For starters, I think many if not most of you have read it and second, the summary is not the interesting part. I’d rather look at why it is a classic and deserves the recognition that it gets. The Grapes of Wrath is the most approachable example of great literary fiction that I have encountered. Steinbeck uses straightforward metaphors and a vocabulary that is accessible that sacrifices nothing. The characters feel as real as any and very often like people we know. The dialogue is simple in the way that it feels natural and unforced. While I am not doing a full summary I will offer this refresher: the book is about a poor family forced from their land in Oklahoma and travels west to California to start anew. They do not dream of striking it rich but rather achieving what we would consider a comfortable, middle-class living. They want to own a house and land they can work themselves. They want to provide for their children and take care of the family. Family is a major theme throughout the novel. As can be expected, the family faces struggles and hardships and in the end has less than that with which they started. 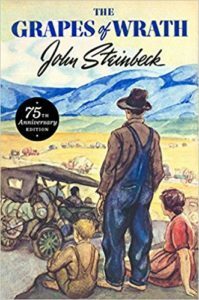 It is a sad depressing tale that despite being written in 1939 and representing the Great Depression, completely represents what many American families experience today. The Grapes of Wrath could easily take place today without many major changes to the novel. Banks and wealthy landowners display a disregard for the average person that is no different that banks and wealthy business owners today. One theme that repeats throughout the novel is that the Joad family cannot believe that one man owns a million acres and doesn’t even farm it all. That the food they desperately need is often left to rot so as to keep the profits high for the business owners. Men try to unionize to ensure fair treatment and are beaten to death or jailed. This is an accurate reflection of life for many Americans today. While union members are not literally beaten to death today, they are demonized and many states are passing right-to-work laws to limit their influences. The analogy to life today is not a leap but rather a shuffle. One part I found most prescient and depressing is a passage wherein a local Californian is angry that the migrant “Okies” want to be paid like hime when he does a real job. I see no difference between that argument then and the arguments against raising the minimum wage today. That is the aspect of the book that makes it so great and so awful, emotionally, at the same time. Nothing has really changed from the time Steinbeck wrote The Grapes of Wrath to today. I put forth this scenario for discussion: Change the family name from Joad to something of Mexican descent and The Grapes of Wrath is exactly the same for the migrant workers in America today as it was in 1939. I find it impossible to read this novel and not feel an overwhelming flood of empathy for the Joads. All that family wants to work hard and earn an honest living and they are denied that opportunity. I am beyond heartbroken that an ideal I consider quintessentially American, that she is the Land of Opportunity, is still denied to people who deserve a chance. And for what purpose are they denied it? Greed, plain and simple. I don’t know how to fix this or if it is human nature but I know that Steinbeck held up a mirror to us 80 years ago and it is still showing the same thing today. Share the post "Mine eyes have seen the glory"
Great review! I recognise that overwhelming feeling. Steinbeck is such a master and it hasn’t lost any of its power. I was in a slump for weeks after I read it.